Soak up the sun, ice-cream in hand, with Aileen Evans on the Isle of Man coast path; discover the secret side of Snowdon with Rachel Crolla; cycle downhill for five weeks on the Danube Cycleway with Mike Wells; climb Kilimanjaro with Alex Stewart; and feel the sting of sub zero temperatures climbing K2 - the Savage Mountain - with Alan Hinkes. Also featured are ten tales of mishaps and misadventures that have befallen Cicerone authors while out and about, researching for a guidebook. Between stifling giggles and gasping out loud, gain greater insight into the mighty task that is guidebook writing. 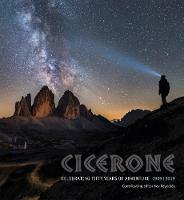 And in 'The Cicerone Story', learn about other aspects of guidebook creation, and discover how things have changed over the last fifty years. Accompanied by outstanding photography, each page of this finely crafted anniversary book is a veritable visual delight. As enchanting as it is inspiring, Fifty Years of Adventure is a must for anyone with an appreciation for adventure.